The club has 5 private dining rooms and several spaces to host a beautiful event. A large, but cozy space with overstuffed chairs and a roaring fireplace with walls colored in British racing green and covered in Western art. 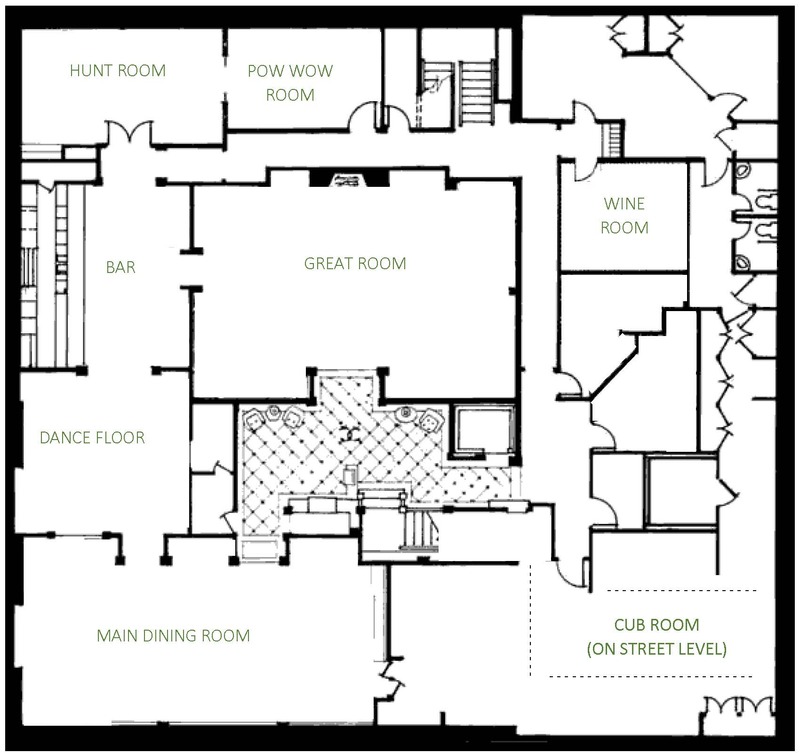 The Great Room & Main Bar accommodates up to 150 guests for reception (200 with Dance Floor). Candlelight and dimmed antler chandeliers provide an intimate atmosphere. The tables are dressed in Frette Egyptian cotton linen and crystal glassware. Accommodating 50-100 guests for private events or á la carte dining. It is adjacent to the dance floor which can be used as additional seating for a large group, or a really great table for late night bottle service! Belly up to this handsome bar and find your favorite scotch, cognac, grappa or a new friend to engage in conversation while sampling your favorite cocktail. Better yet, ask to see the champagne list and pop open something really special. The mirrored dance floor and large antler and crystal chandelier really heats up after 10:30pm, but it is also a great semi-private spot to host up to 40 guests for dinner. The gorgeous yet comfortable room has material-lined walls boasting David Levinthal photographs. A wonderful room for private dinner parties for up to 30 guests, and is also the ideal space for an après party, VIP lounge with bottle service or a great food station when taking over multiple areas. When the doors are closed, your event is completely private and shut away from the bustle that envelops the rest of the club. Or keep the doors open to have a retreat from the crowd, and still be a part of the club’s festivities! Dine on creative & contemporary American cuisine in a 19th century style salon with prints of the West. The Cub Room can accommodate up to 24 for dinner parties. Open the French doors to Caribou Alley and have a beautiful, outdoor, “bistro” style cocktail party for receptions or dinners. The Cub Room overlooks the flower-festooned Caribou Alley (Atrium) through lace-curtained French doors. The flower-festooned Caribou Alley features the store windows to tempt your guests, and is ideal for receptions. It is a very versatile space that holds 15 – 80 people for receptions or 60 people at one long table for an elegant sit down brunch, lunch or dinner. This patio area, atrium, café, bistro… or whatever you want it to be, is covered with a custom sun roof to protect you and your guests from the elements.